The Short: If you find your insect pest management slipping with increasing damage from codling moth (CM), you should consider the use of pheromone trapping for the adult CM during bloom. The first adult flight signals the adult biofix and model prediction for larval emergence. The use of models combined with your orchard site pheromone traps is the best way to time directed applications for this pest. This would also be the optimum timing for placing CM mating disruption (MD) dispensers in orchard blocks of 5-acres or more. MD will reduce mate finding leading to reduced viable egg laying and worm injury. The use of MD in problem orchards will reduce the pressure placed solely on the use of insecticide programs to control the pest. A number of products are available for use in New York State. In blocks of high fruit infestation from codling moth in 2017, a possible cause may have been the use of materials ineffective against the worm during the three generation emergence periods of the larval stage, most notably the 3rd generation in September. The use of Actara (thiamethoxam) for plum curculio at PF, 1st or 2nd cover will not have provided commercial control of the 1st generation CM. The possibility of frequently used insecticides slipping is also a possibility. Adult flight is now beginning. The use of pheromone traps are the growers best indication of first flight on their farms while providing adult male numbers to understand population density in specific blocks. Temperatures below 60°F, which we have been experiencing in the Hudson Valley, impede male activity and prevent mating, so a cooler spring will delay significant egg hatch for the first generation. NEWA weather data is available to help predict this, incorporated into the degree day model. The moth has been observed to produce two peaks during the 1st generation, often extending its flight well into the summer. We base our management of the insect on codling moth larval emergence using a predictive degree day model of 220 degree days from CM adult first flight. Two applications, which often start at 1st cover, are needed to cover the emergence period in blocks where CM has caused historical fruit injury. The 2nd application often (but not always) made on the heels of 1st generation obliquebanded leafroller emergence. Mating disruption (MD) of codling moth is currently used in 90 percent of all apples and pears grown in Washington State, with relatively few acres (but on the increase) using MD for codling moth in NYS. Details on the implimentation of MD can be found in the article titled “Managing Codling Moth and Oriental Fruit Moth In Apples“, by Deborah Breth, CCE, LOF IPM Specialist & Team Leader; Art Agnello, Dept. of Entomology, Cornell University; Elizabeth Tee, CCE -LOF Program Aide. Mating disruption options listed can be obtained from pest management distributors that include nIsomate-CM/OFM Twin Ties (TT) employed at 200 ties/ acre, Checkmate CM-F 14.3S used at 2.4-4.8 fl.oz./acre and Checkmate CM-OFM Duel using 150-200 dispensers/ acre. There haven’t been recent studies to detect phosmet resistance to CM in NY that I’m aware of. In Michigan, a study in 2008 detected a 7-8 fold level of resistance in orchard site specific CM populations to codling moth (see abstract from work done by John Wise in Mich. State below). However, no resistance to acetamiprid (Assail) and spinosad (Delegate, Spintor, Entrust) was detected in the study. That said, it’s very likely we have codling moth populations resistant to older insecticide classes, including pyrethroids and OP’s in orchards throughout the Northeast. Remember to rotate classes for EACH GENERATION and not each spray during a generation, to reduce the potential for insecticide resistance. Pest Manag Sci. 2008 Sep;64(9):881-90. doi: 10.1002/ps.1576. 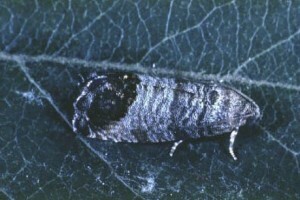 Resistance of codling moth, Cydia pomonella (L.) (Lepidoptera: Tortricidae), larvae in Michigan to insecticides with different modes of action and the impact on field residual activity. Mota-Sanchez D1, Wise JC, Poppen RV, Gut LJ, Hollingworth RM. The codling moth is one of the principal pests of apple in the world. Resistance monitoring is crucial to the effective management of resistance in codling moth. Three populations of codling moth in neonate larvae were evaluated for resistance to seven insecticides via diet bioassays, and compared with a susceptible population. In addition, apple plots were treated with labeled field rate doses of four insecticides. Treated fruit were exposed to neonate larvae of two populations from commercial orchards. 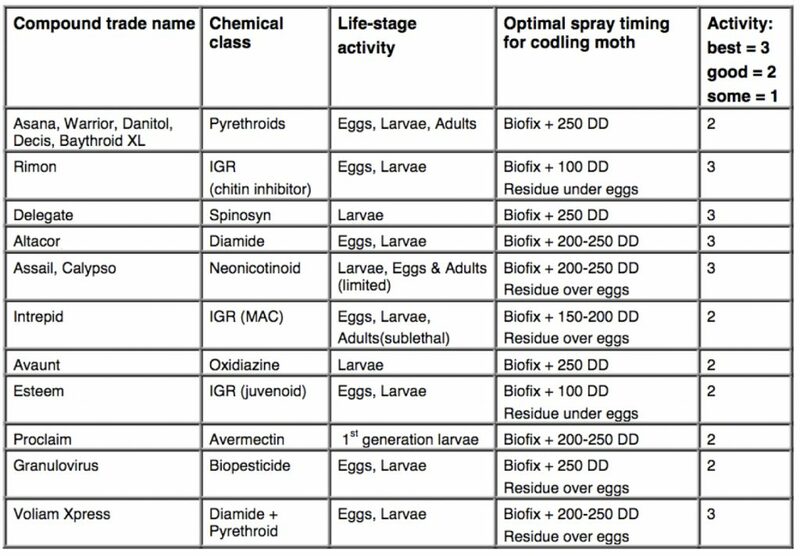 RESULTS: Two populations of codling moth expressed two- and five fold resistance to azinphos-methyl, seven- and eight fold resistance to phosmet, six- and tenfold resistance to lambda-cyhalothrin, 14- and 16-fold resistance to methoxyfenozide and sixfold resistance to indoxacarb, but no resistance to acetamiprid and spinosad. The impact of the resistance to azinphos-methyl, measured as fruit damage, increased as the insecticide residues aged in the field. In contrast, fruit damage in methoxyfenozide- and lambda-cyhalothrin-treated fruit was observed earlier for resistant codling moth. No differences in efficacy were found for acetamiprid.CONCLUSIONS: Broad-spectrum insecticide resistance was detected for codling moth. Resistance to azinphos-methyl, lambda-cyhalothrin and methoxyfenozide was associated with reduced residual activity in the field. Broad-spectrum resistance presents serious problems for management of the codling moth in Michigan.